You'll often hear us express our gratitude for the opportunity to serve you...it truly is a pleasure. In recent days, we've been asked to "hand make" a few jewels for special gifts; this privilege is one for which we're especially grateful. A few of them are featured on this blog page. Seeing a piece "come to life" at the bench is something that brings great enjoyment. Many times, a simple sketch on paper launches the process that culminates in the finishing of a wearable piece of art. When the client comes to see it for the first time in real life, we all celebrate! 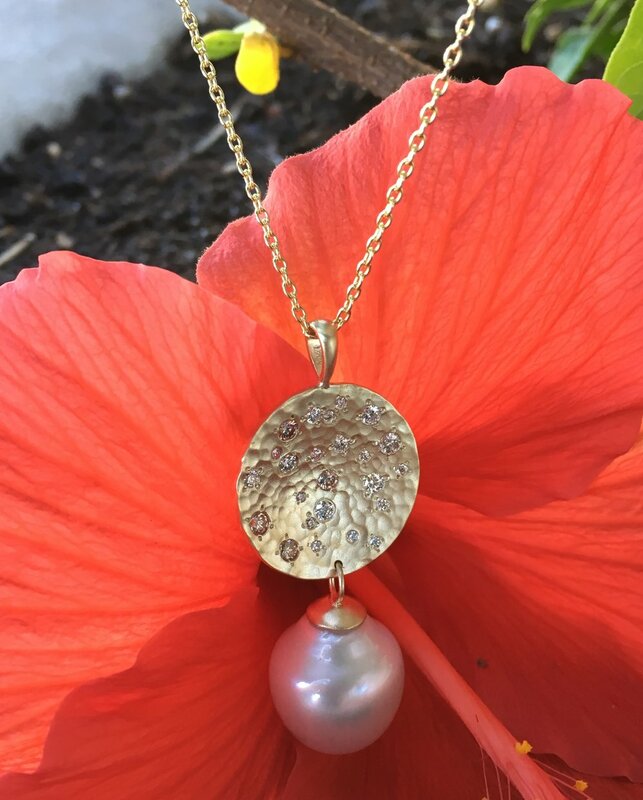 What struck me so vividly when sitting down to write this blog was the thought of the human connection--the personal connection to you, our friends, and to the jewelry itself. Hand-forged Sterling Silver pendant with diamond accent. Hammered and textured. Hand-made pendant in 14K yellow gold, set with near-colorless and natural brown diamonds. A South Sea cultured pearl dangles below. A rosy-pink Tourmaline set in Sterling Silver. A classic pendant design, hand-set in our shop.